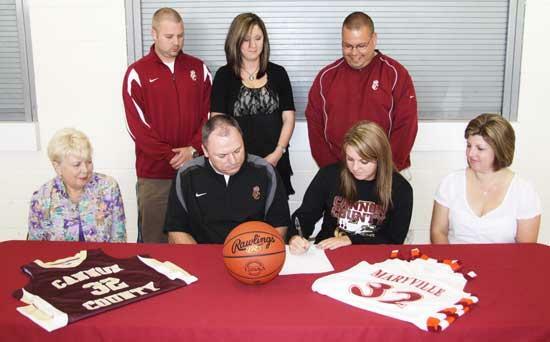 Former CCHS girls basketball standout Lauren Ruehlen recently committed to continue her career at Maryville College. On hand for the signing were, seated from left, Janey King, Danny Ruehlen, dad; Lauren Ruehlen and Kristy Ruehlen, mother. Standing, from left, CCHS Head Boys Basketball Coach Matt Rigsby, Shelley Rigsby and CCHS Girls Head Basketball Coach Michael Dodgen. Less than six months ago Lauren Ruehlen's prep basketball career was in limbo; however, through perseverance and determination she not only played, but also was a chief contributor to one of the best seasons in Cannon County girls basketball history. Ruehlen's perseverance was further rewarded when she recently committed to continue her basketball career at Maryville College in Maryville, Tenn.
"I've learned that you can't let people tell you that you can't do something because there is always a way if you believe enough and work for it," Ruehlen said. "I'm excited about this opportunity and so grateful to be able to (continue playing in college)." Ruehlen, the daughter of Danny and Kristy Ruehlen, suffered an ACL tear that ended her season prematurely at the end of her junior year. She missed spring practice and summer team camps but through dedicated rehabilitation and drive Ruehlen was well on her way to recovery and awaiting what was anticipated as a special senior campaign. Until she suffered another setback during preseason practice in November, 2010. "When I had the second ACL tear I never thought (playing college basketball) would be possible," Ruehlen said. "When it happened doctors told me I would likely miss up to three months. To me that was like missing an entire season. " Ruehlen went back to work and within a month she was back on the court. "A lot of kids would have quit after the second setback but (Ruehlen) was determined," Cannon County Head Girls Basketball Coach Michael Dodgen said. "She went and got multiple opinions of what she could and could not do and then she went through a lot of rehab. Lauren played hurt a lot and people will never know how tough it was because she never made excuses about it. She played as hard as she could to help us get to the state tournament. "I'm more proud of her for being able to continue on after the setbacks she has had. Through injuries and things like that she has battled through it and made a name for herself on a team that accomplished a lot, and she was a big part of that." Ruehlen helped lead the Lionettes to a 30-8 season, the Region 4-AA Championship and a Final Four finish in the TSSAA Class AA State Tournament. Ruehlen averaged 7.6 points per game and scored 851 total points in her career. Her 685 career rebounds rank third on the Cannon County all-time list. Dodgen said Ruehlen was on pace to score 1,000 points and collect more than 1,000 rebounds during her career prior to her knee injuries. "She was arguably one of the best post players in our district," Dodgen said. "She could score on the low block, step out and shoot, rebound. When she got hurt that hampered a lot of stuff. When she had the time to rest and recover she was tough." 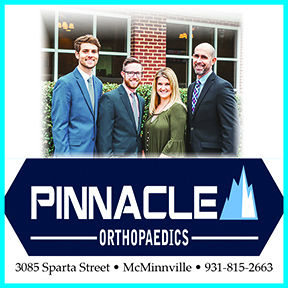 Ruehlen will take a redshirt season in 2011-12 and continue working with the sports medicine staff at Maryville College before returning the hardwood. "We are thrilled to add Lauren to our roster," Maryville Head Coach Darrin Travillian said. "She comes from a winning program, as evidenced by her success in the state tournament, and she knows what it takes to be successful. Lauren is an excellent rebounder on both ends of the floor and has a nice touch around the basket. She will spend this upcoming season rehabbing her injured knee and getting acclimated to college life, but we know she will add a great deal to our team in the near future." Maryville was 21-5 during the 2010-11 season and won the Great South Athletic Conference with a sparking 14-0 mark. Marvyille has been one of the top NAIA programs in the nation during the last decade. During this 10-year span the Maryville women's program has made eight NCAA Tournament appearances, won nine Great South Athletic Conference regular season titles, seven GSAC Tournament championships and posted a 208-74 record for a .738 winning percentage.